A FRIEND OF OURS IS RETIRING FROM SCHOOL BUS DRIVING TODAY. I wanted to find a little toy school bus at Goodwill. 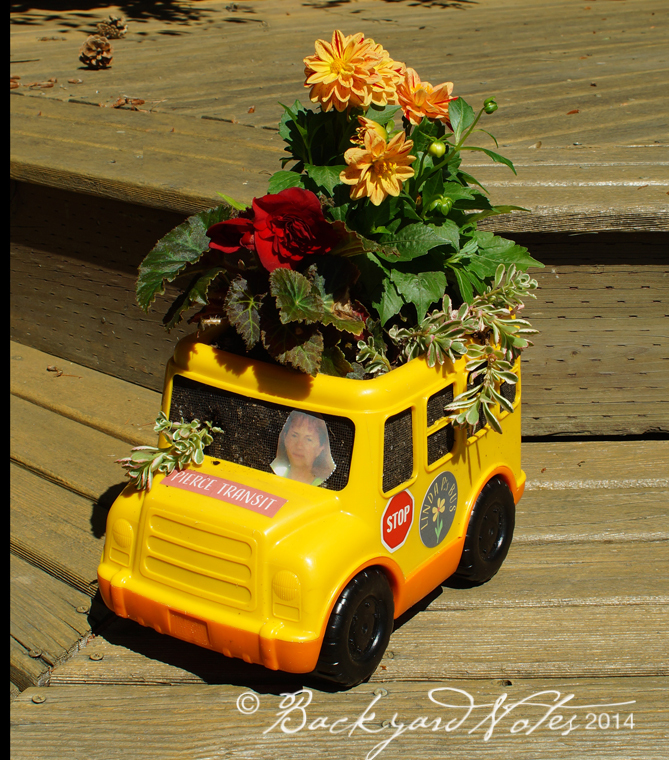 What the groundskeeper found instead was a BIG school bus toy with an open top that I immediately saw as a planter! After a few holes were drilled in the bottom for drainage, I added window screen mesh on the inside to keep the soil in. 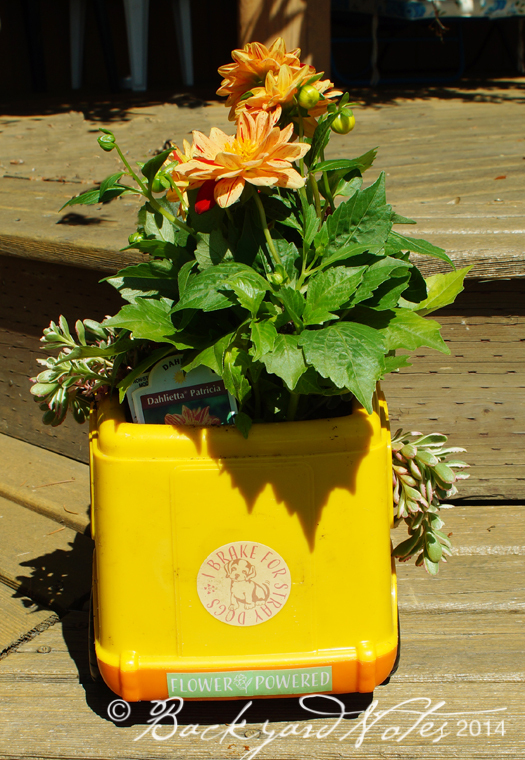 I added a few homemade stickers and plants and here it is. I think it’s adorable and I think our friend will too. Our friend is a dog lover who fosters dogs. 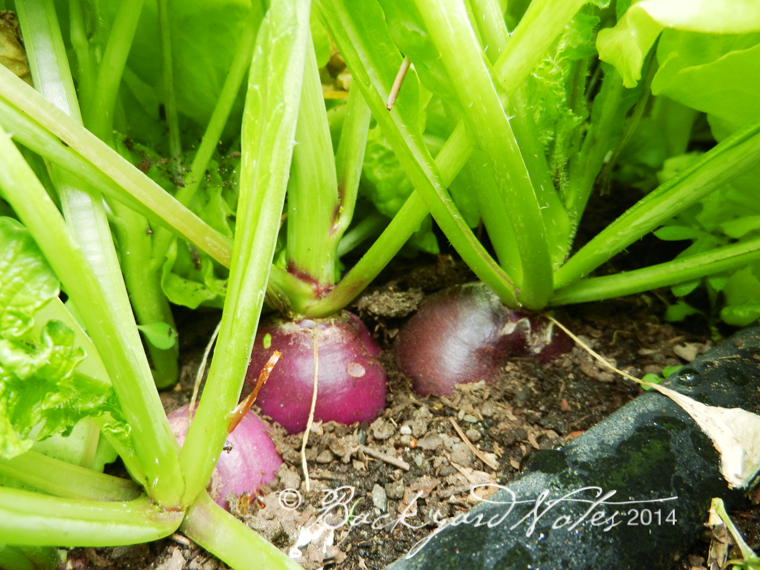 ABOUT THE RADISH TOPS. 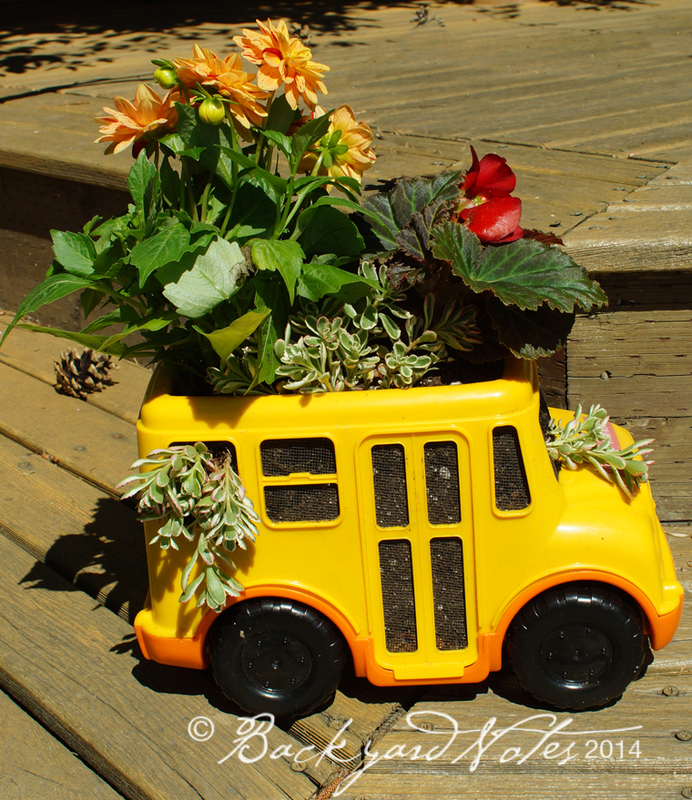 I had intended to make this post yesterday after a prolonged hiatus of from the blog (too many other projects to deal with), but that bus planter was just too darn cute to leave out. 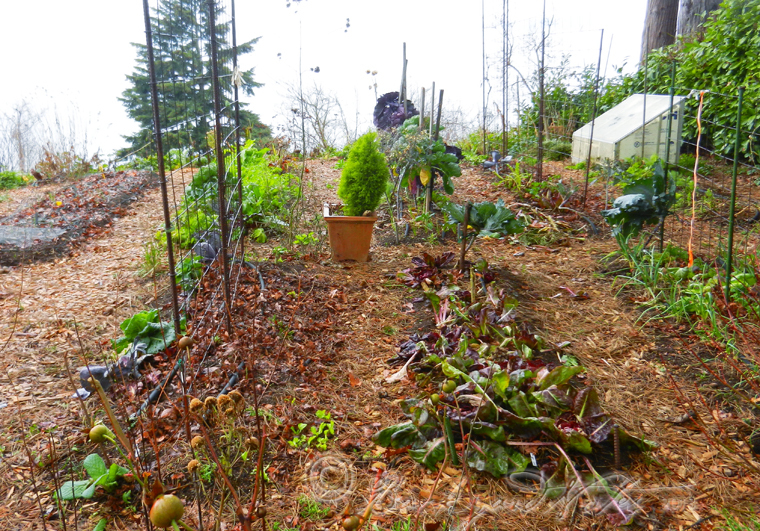 I picked some very nice radishes on Wednesday and the tops were too nice to toss into the compost. 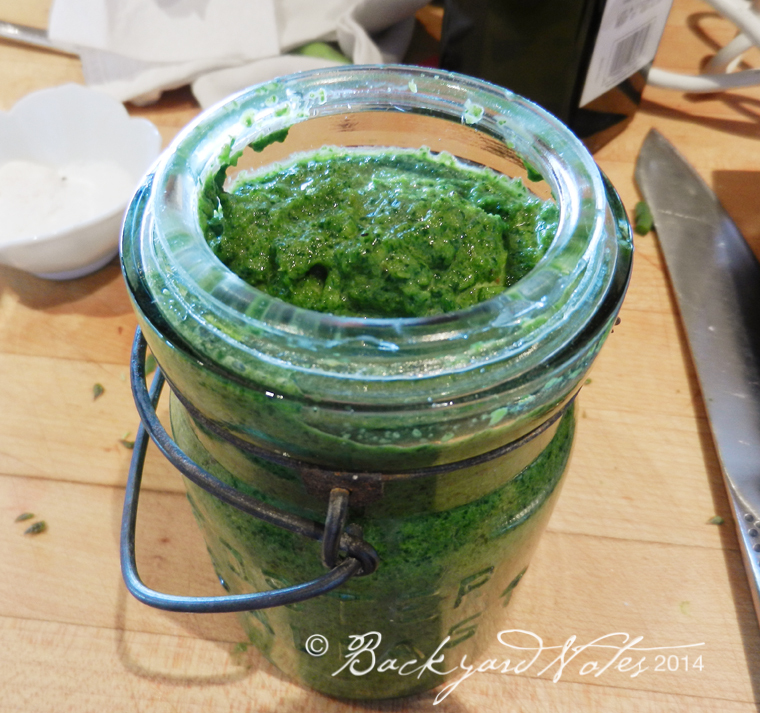 They had a slightly tart flavor and I thought they would make a nice ‘pesto’ type sauce. 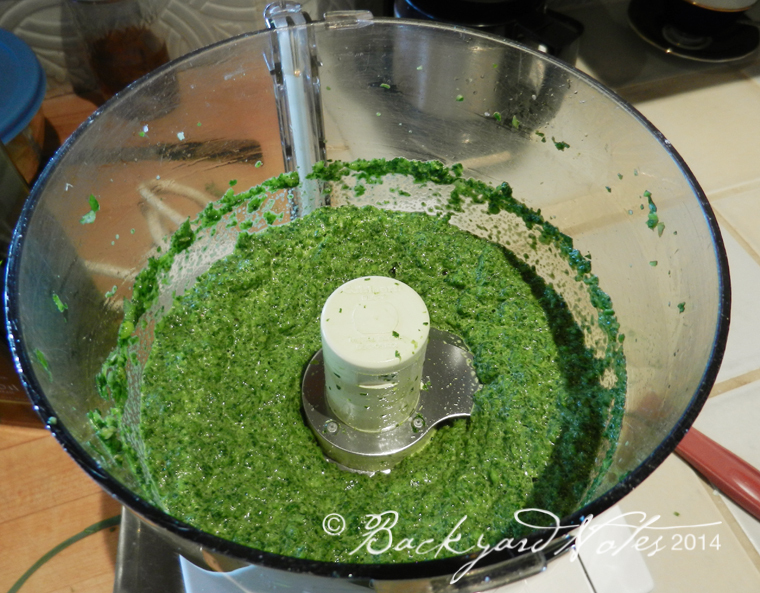 I combined the radish tops with some aspargus spears and four or five garlic scapes in the food processor. 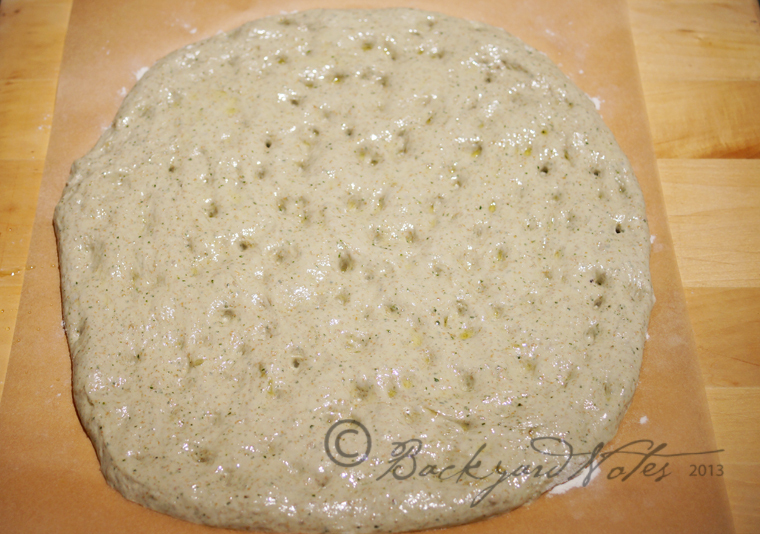 Add some olive oil and a little salt, pepper, and purée until smooth. Taste for seasoning. 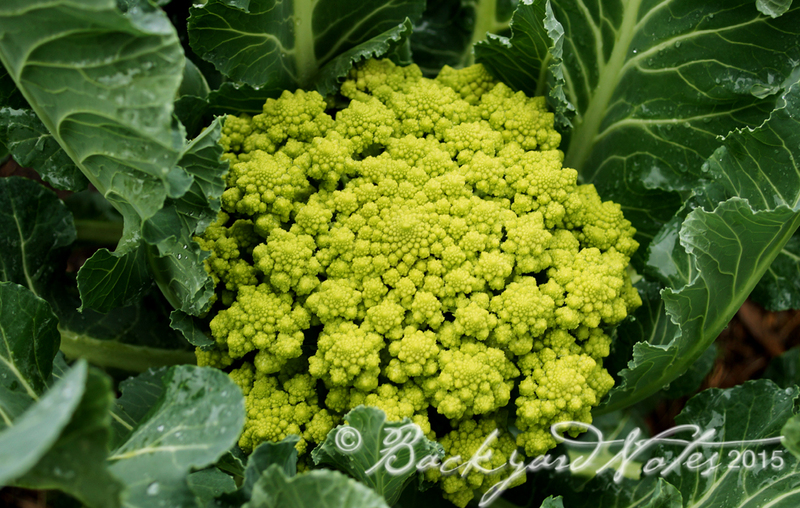 At this point it can be put up in small jars, topped with a little olive oil and frozen for later use or top with oil and store in the fridge for a couple of weeks. 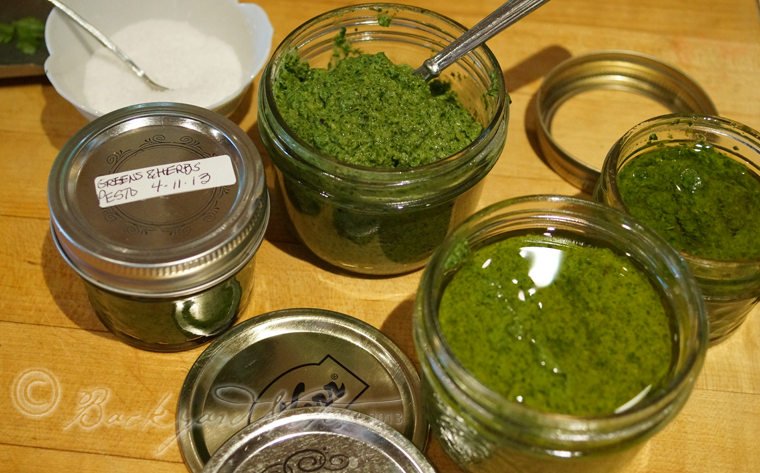 Cheese can be added just before using if you plan to use it on pasta in a more traditional pesto style. 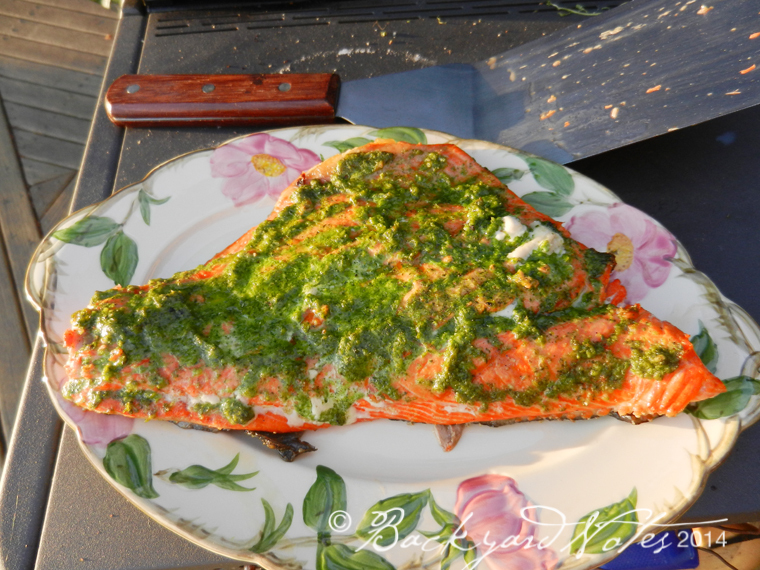 We cooked a piece of Alaska sockeye salmon on the grill adding some of the sauce near the end of cooking. Using radish tops was new for me. 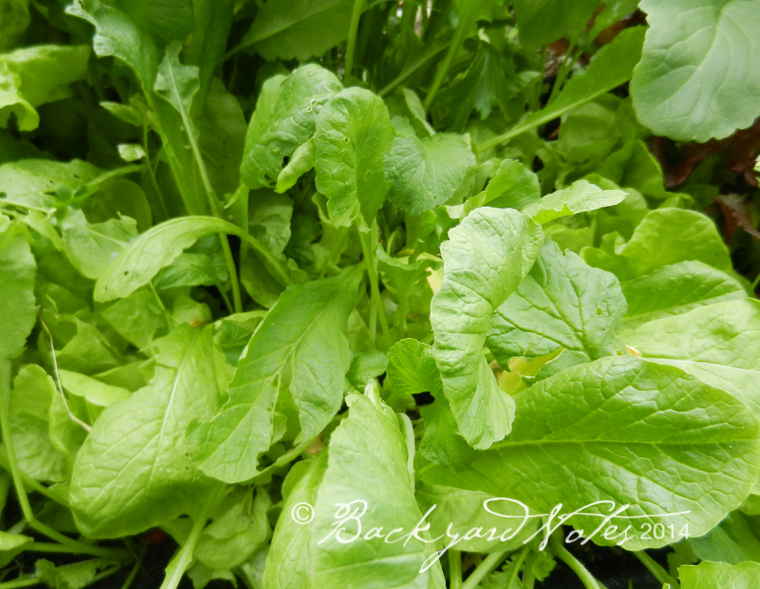 I knew they were not much different from most mustard greens other than the leaves being a bit fuzzy, so I thought: Why Not? 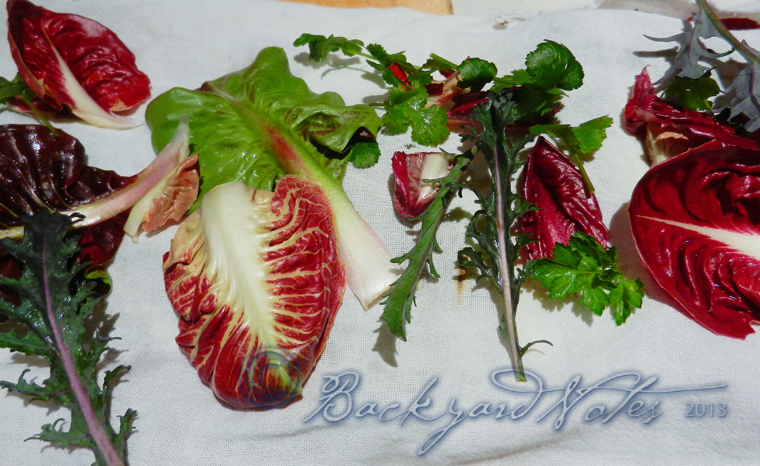 It’s nice to figure out ways to get the maximum out of what I harvest from the garden. 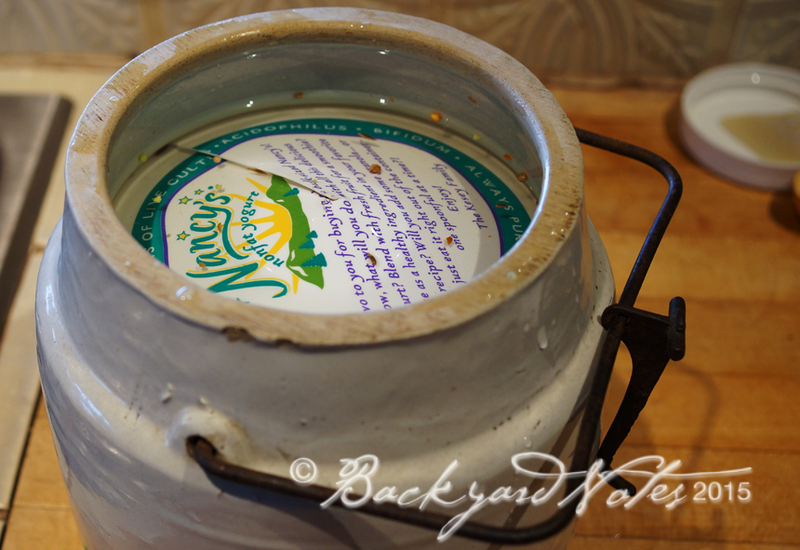 Maybe carrot tops will be next! How do you maximize your harvest? EARLIER THIS MONTH we had some decidedly cold weather for these parts–a week of temperatures in the low-to-mid 20’s overnight and not much above freezing during the daytime. 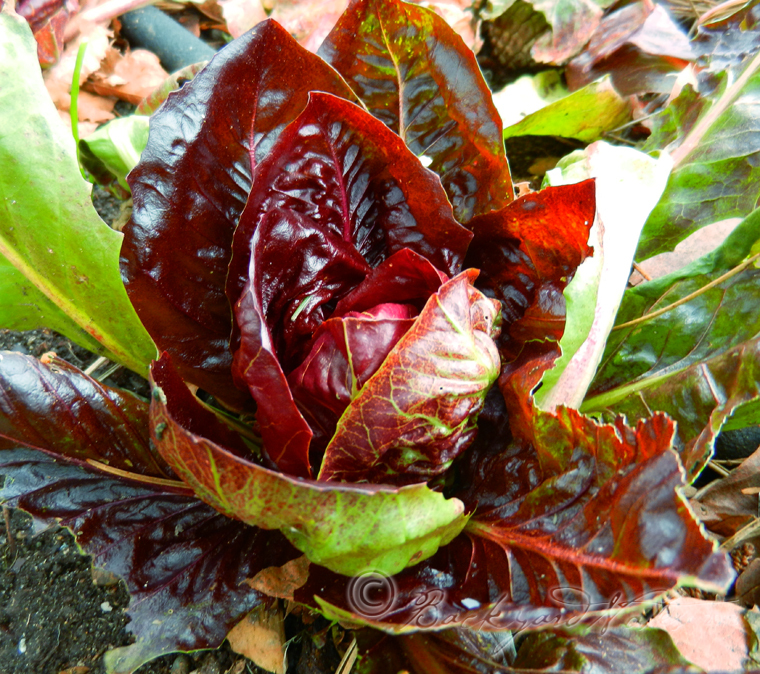 Some of the more winter hardy vegetables are rebounding and shedding leaves that have turned to mush. 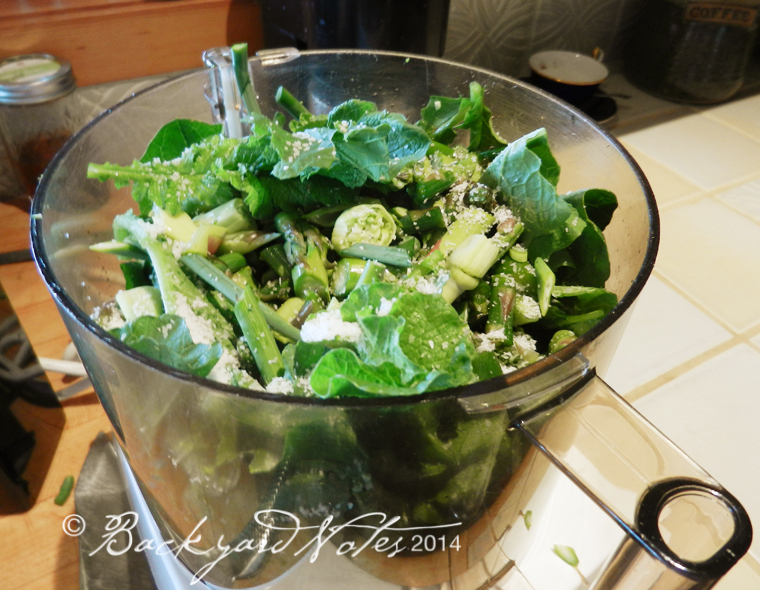 Often at this time of year there are slim pickings for salads, but who doesn’t love a challenge? 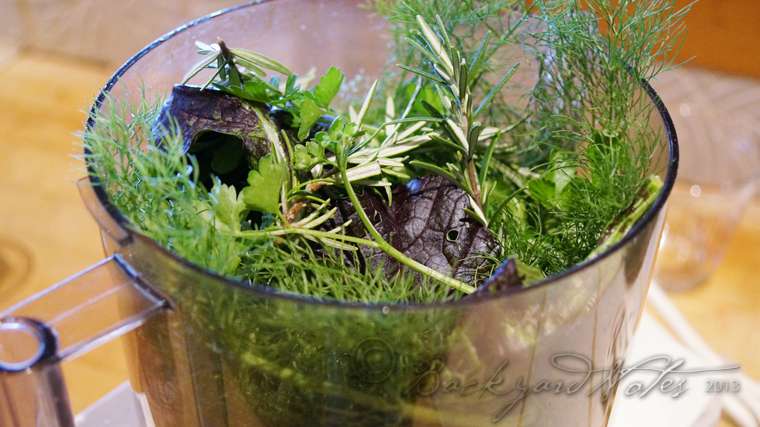 Late yesterday I went foraging for salad material. 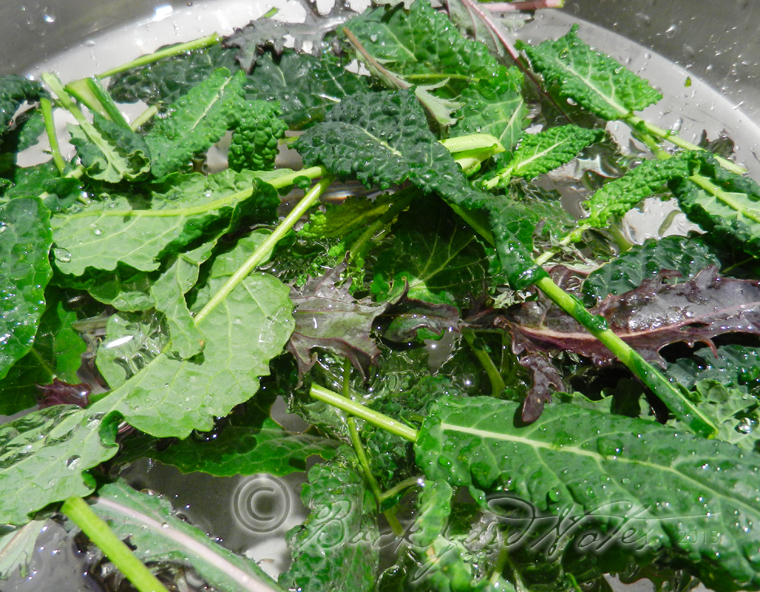 I was able to collect some small, barely heading radicchio, lots of parsley, some Mibuna type mustard greens, cilantro, lacinato kale, small leaves from Rosalind broccoli, and some Rubine brussels sprouts; all hardy, hearty and strong greens. 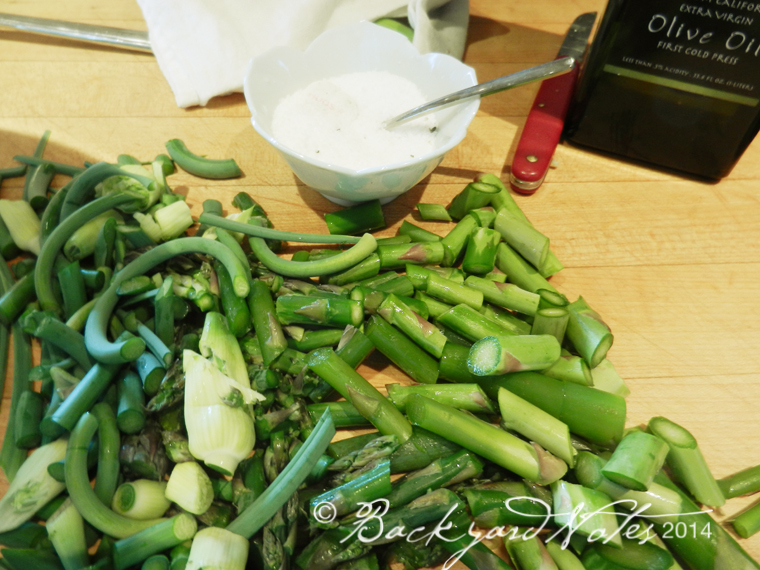 Now, to put together the right dressing, equally hearty with flavors to stand up to and compliment the bitterness and ‘greeness’ of some of the greens. 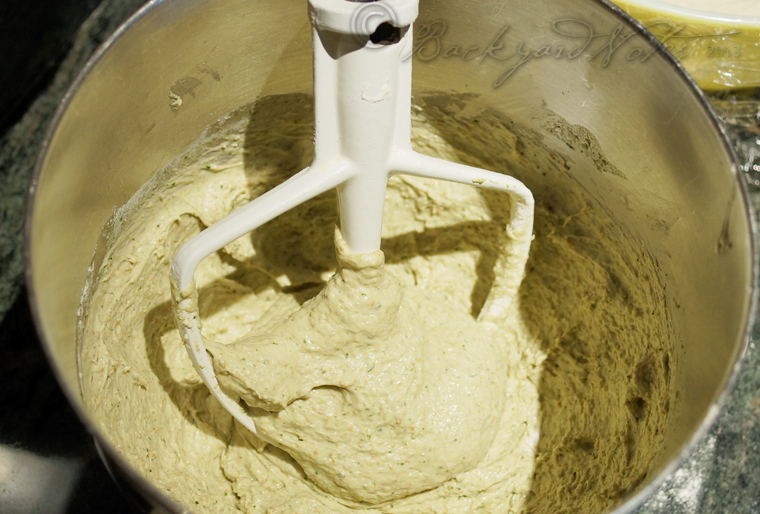 My favorite salad bowl was probably made for proofing bread dough once-upon-a-time. My grandma Aggie always had it filled with unshelled nuts, especially from Thanksgiving to Christmas and I never saw bread dough in it. 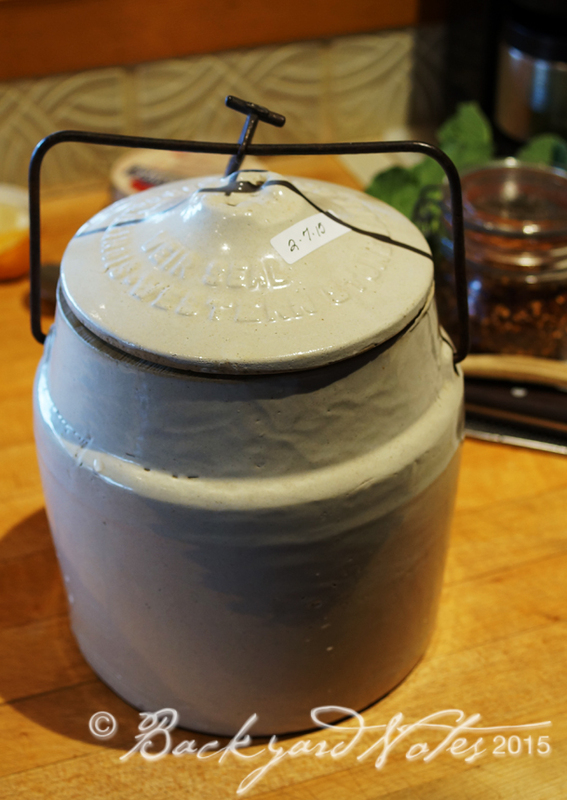 I have owned it for 40 plus years and it is well seasoned by now. 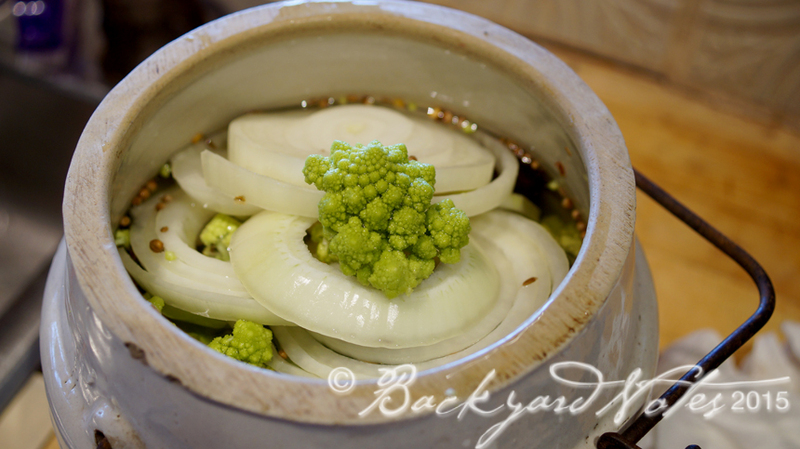 I mashed 2 cloves of garlic with some coarse salt into a paste; mashed 2 anchovy filets into a paste as well. To the garlic and anchovies, I whisked in 1 1⁄2 tablespoons of fresh lemon juice, two teaspoons Dijon mustard and three tablespoons of grassy olive oil. 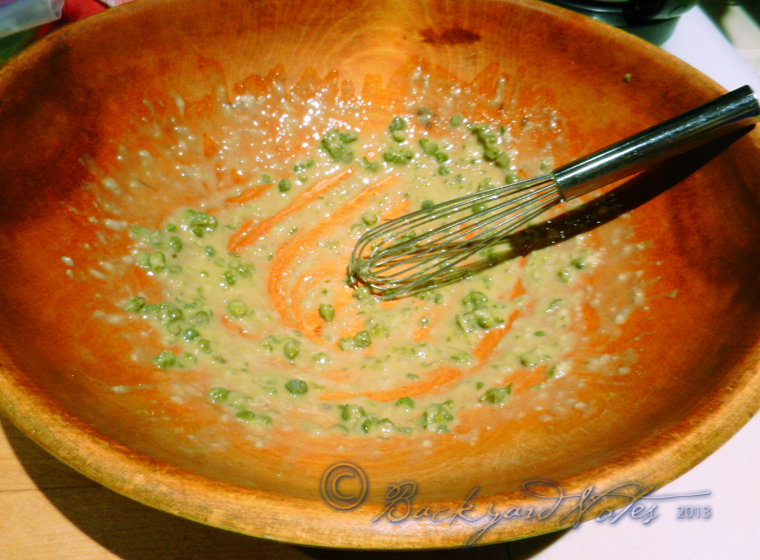 About a tablespoon or so of capers added some extra punch. 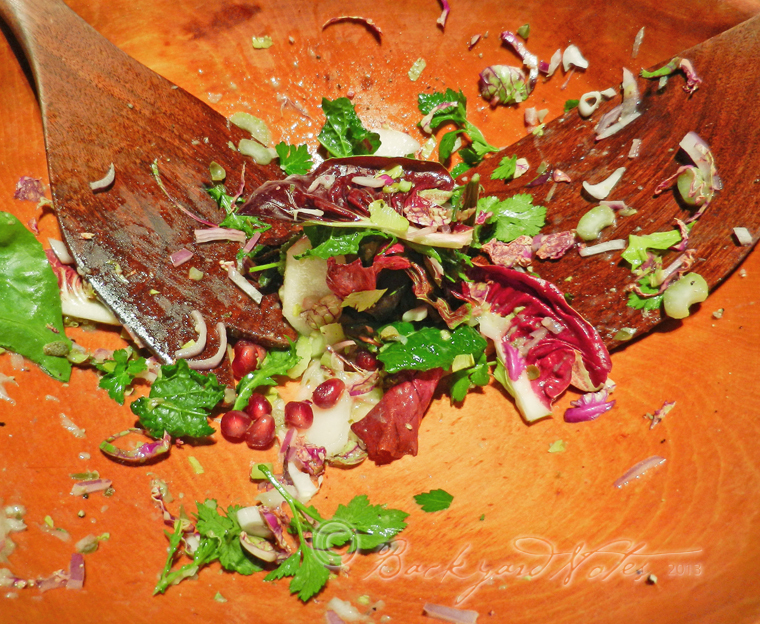 I added the greens, a little sliced celery and sweet slices of pear, the last one from our tree; tossed all together, sprinkled on some pomegranate seeds and a few grinds of pepper. 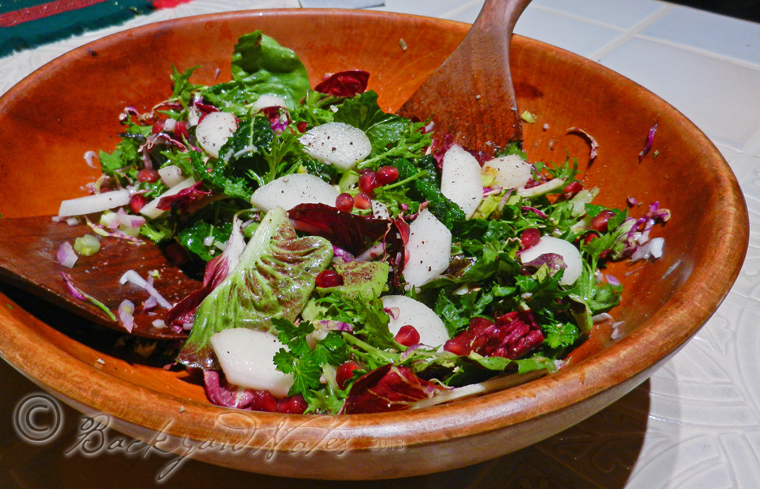 It was a fantastic salad, with bright and biting flavors. It may be on the menu tonight too! A BIG THANK YOU to everyone who has stumbled upon this blog and paused to read one of my posts, and to those of you who subscribe. 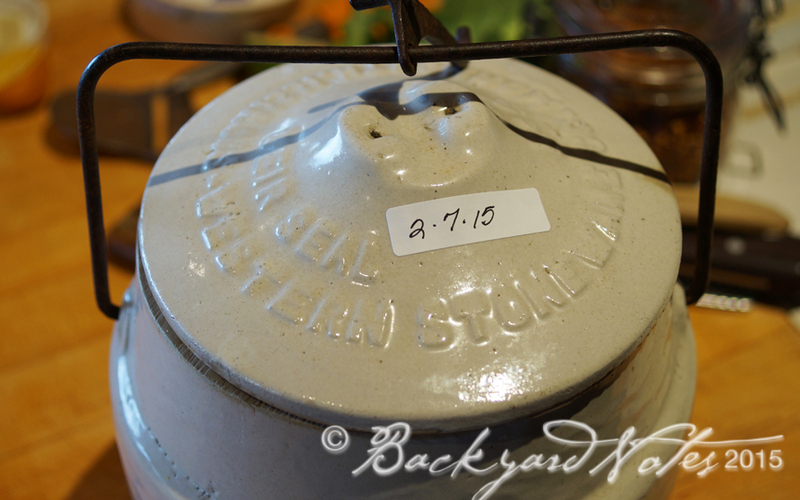 This is my 151st post since I began the blog in 2009. This year posts were kind of sporadic and I took a two month break; I might still have something left to say in 2014. May you all have a HAPPY NEW YEAR IN 2014! French Breakfast, black, New Crown Daikon, Round Core Shrinmei & Easter Egg. 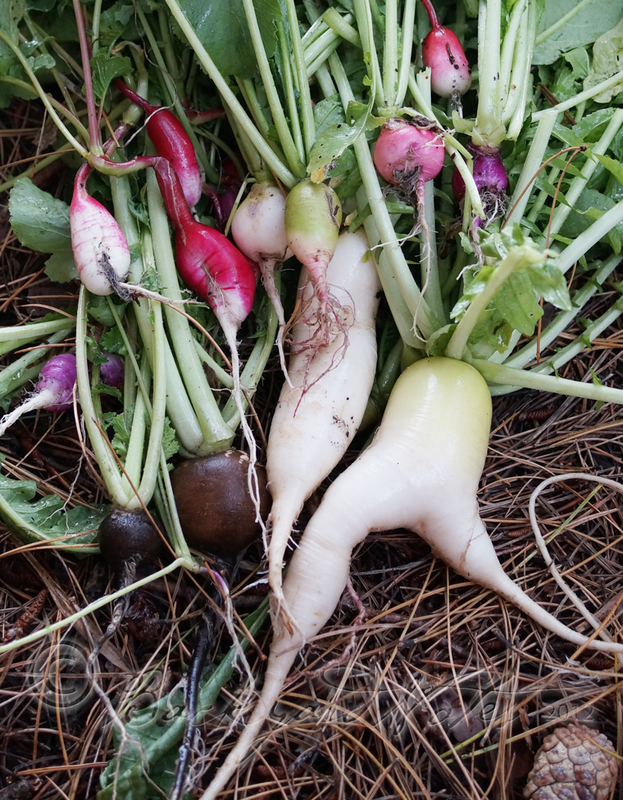 IT’S A FEAST OF RADISHES HERE at Backyard Farm. 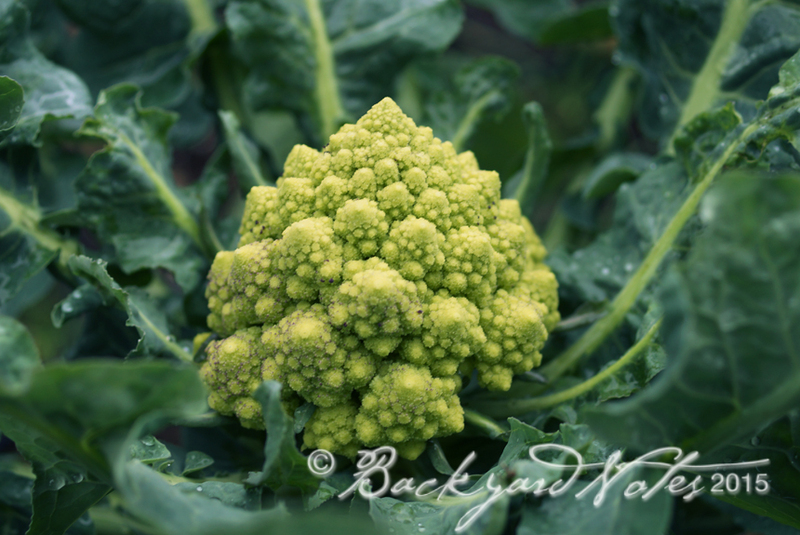 Most were planted mid-to-late August. 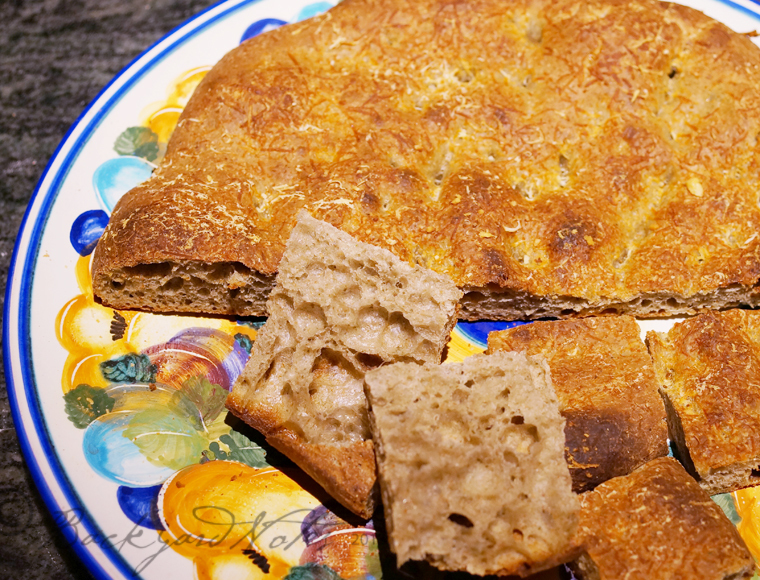 The smaller French breakfast type are now getting a bit hot and woody/spongey. The large daikon type radishes are probably good for another month or more if they don’t become buggy as they grow larger and some of the black radishes are golf ball size or larger. Pretty round core and assorted radishes. So far, the favorite is the red centered round core – so pretty, tasty and photogenic! 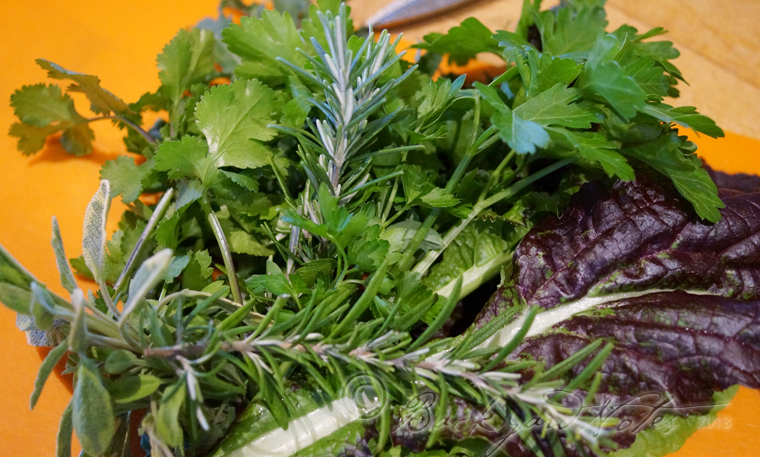 Lots of paper thin slices tossed with a bit of lemon juice, finely chopped parsley, some olive oil, and salt make for a wonderfully sassy and refreshing salad. 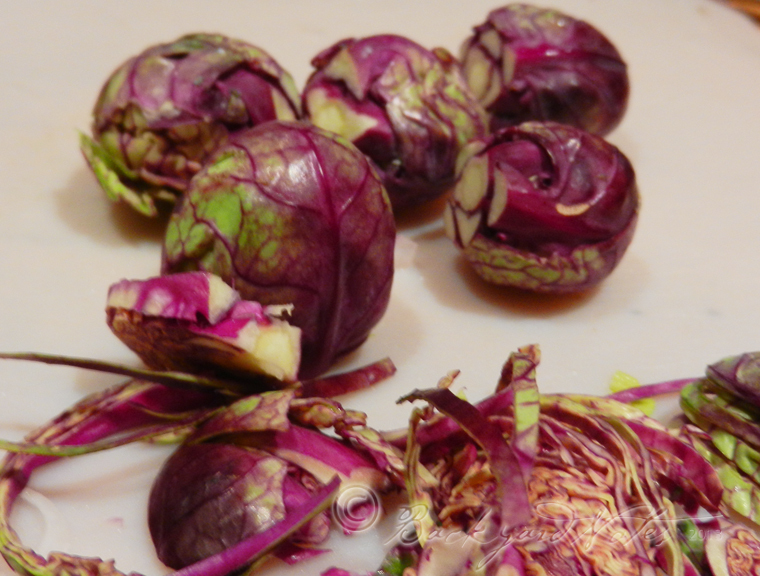 The daikons are sweet with just a little heat; the black radishes have some heat, need peeling, and good for raw eating if sliced paper thin, but are probably best when cooked (like turnips). 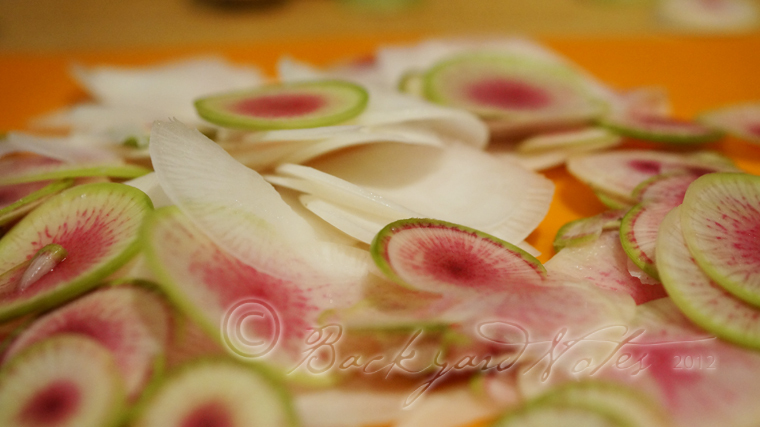 Got a favorite radish variety or ways to eat them?